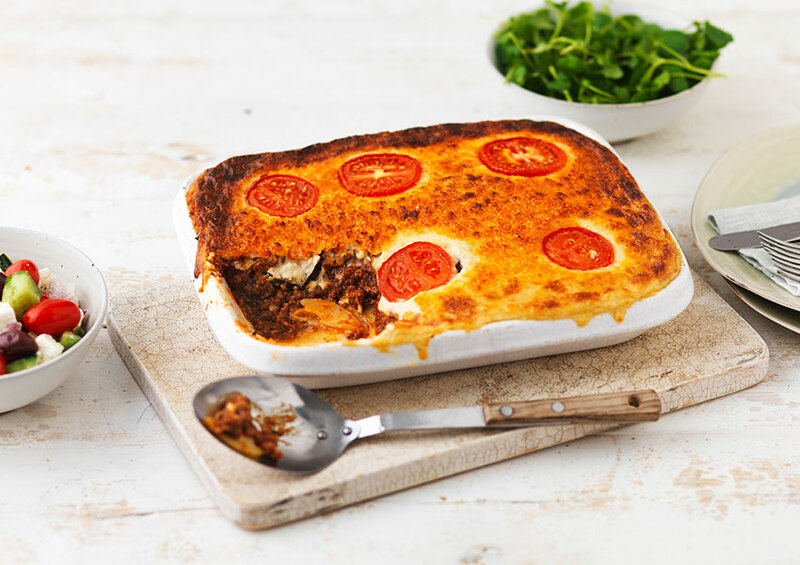 Slow cooked minced lamb, tomatoes, red wine and herbs, layered with sliced potatoes, aubergines and creamy béchamel. New Zealand Lamb (23%), Cows' Milk, Potato (17%), Double Cream (Cows' Milk) (9%), Tomato (7%), Aubergine (5%), Red Wine (4%), Onion, Tomato Purée, Greek Hard Cheese (Cows' Milk, Anti Caking Agent: Potato Starch) (2%), Free Range Egg, Cornflour, Lamb Stock (Lamb Juices, Water, Carrot, Onion, Mushroom, Leek, Garlic, Tomato Paste), Fortified British Wheat Flour (Wheat Flour, Calcium Carbonate, Iron, Niacin, Thiamin), Butter (Cows' Milk), Extra Virgin Olive Oil, Mint, Rapeseed Oil, Salt, Garlic Purée, Yeast Extract (Barley), Oregano, Sugar, Nutmeg, Paprika, Cinnamon, Black Pepper, White Pepper. Produced in the United Kingdom using New Zealand lamb.